HomeAre CA-MRSA more virulent than HA-MRSA? The study tested 22 HA-MRSA strains and 26 CA-MRSA strains from key international lineages in some laboratory models of staphylococcal virulence: the ability to produce Phenol Soluble Modulins (PSMs) and to kill Galleria mellonella caterpillars. 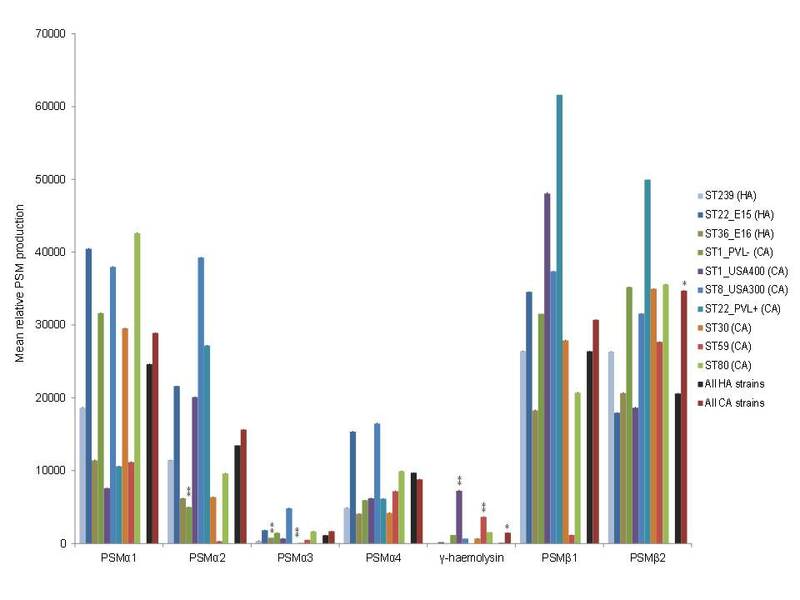 The bottom line is that there was no significant difference in overall PSM production between HA and CA strains (p=0.090) but there was significant variation between clones (p=0.003) (Figure 1). G. mellonella caterpillar killing varied significantly by clone (p<0.001) and overall killing was greater for HA compared with CA clones (p=0.007). Figure: Production of PSMs. The error bars represent plus one mean coefficient of variation (CV) for each data point across the replicates. * = p<0.01 for T-test comparing HA with CA strains; ** = p<0.05 in ANOVA post-hoc testing when comparing clones using ST8 (USA300) isolates as a reference. So, a mass spec machine (that was used to test PSM production) and caterpillar larvae are clearly not satisfactory models of human infections, so these results only go so far. However, they do challenge the status quo that CA-MRSA strains are more virulent than HA-MRSA stains, which has been borne out in some other studies. Most of these studies use only a handful of strains from a single lineage – most commonly USA300 in US studies, which dominate the literature on this topic. Could it be that strain selection rather than inherent bacterial capability has biased the literature towards an association between CA-MRSA strains and increased virulence?